So far, all of the spoilers leading up to Season 5 of The Walking Dead have been bleak. You favorite characters may not make it. There may or may not be some light cannibalism. New episodes don't air on AMC until Oct. 12 and I'm already stressed out.Though to be honest, I'm still confused as to why these guys thought a place called "Terminus" could be any kind of sanctuary. Did they think they were walking into a dance party? Let's muster up some optimism and focus on one of the few positive spoilers. 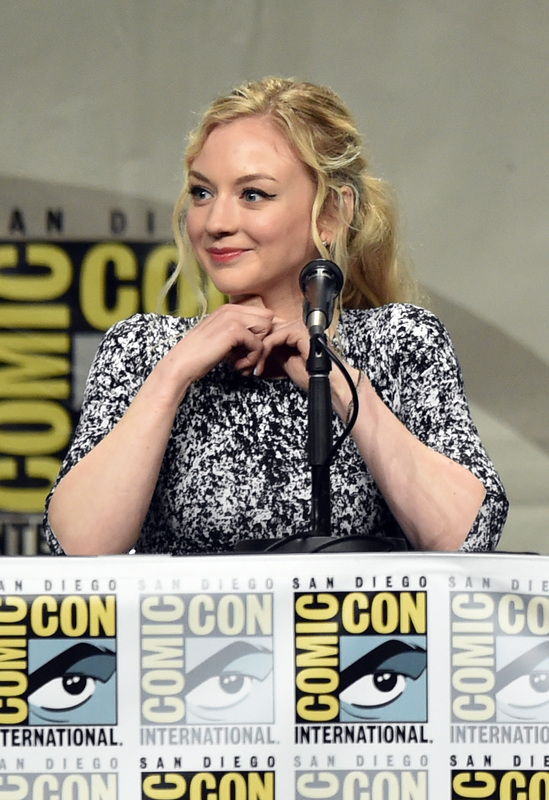 The Comic-Con trailer did give us our first glimpse of the missing Beth Greene, played by Emily Kinney. Yay, Beth is alive! Okay, stop. Enough of that cheerful nonsense. Where the heck is Beth, who took her, how much danger is she in, and how scared should we be for her survival? A few shots from the trailer show Beth being held in a type of hospital ward, fighting off both humans and Walkers to escape. Yikes. Why a hospital? With Rick's gang and their Terminus captors headed to Washington D.C. in search of a cure for the virus, could this be connected? "Every sacrifice we make needs to be for the greater good. In here, you're not the greater good. You're part of a system." It's a direct callback to one of Rick's lines in Season 3, although it expresses the opposite sentiment. Rick views each individual person as "the greater good" and not worth sacrificing. I think that lays out the theme of the season right there. Whatever the hospital is, they have a clear ideology that is not going to gel with our crew. Though something tells me that, to mirror Rick one more time, that officer is screwing with the wrong girl! It's unlikely that this is physically part of Terminus. One shot shows Beth peering down an elevator shaft that runs pretty deep for a train station. Set photos have lead to speculation that the hospital, Terminus, or both, is the televised version of the Alexandria Safe-Zone, as suggested by Wetpaint. On the other hand, the Terminus "advertisements" showed all roads leading there on a map, which could point to the whole cast having made it to the same location. The Terminus residents do appear to be experimenting (or cooking) as well. However, TWD loves a metaphor. If all figurative roads lead to Terminus, that suggests that the two establishments are connected in some way. Almost like they're part of a system. This makes a lot of sense from a storytelling perspective. Alexandria is just outside of D.C. With everyone else heading that way, this gives Beth an opportunity to explore the new world and develop an arc before reuniting with Daryl. I mean... with the group. There are Walkers in the hospital, but it seems like too sterile and controlled of an environment for them to have just wandered in. Whatever the hospital is doing with Beth must involve and/or create the undead somehow. I think it's safe to bet that they are looking for a cure or an antidote, and are willing to sacrifice anyone in the name of science. They are either working to achieve the same result as the Terminus folks with different methods, or their organizations are one and the same. Which means our heroes could be walking into yet another trap. Though, let's be real, Eugene and the others are way too hopeful about being able to find a cure in the first place. There's gotta be a price.